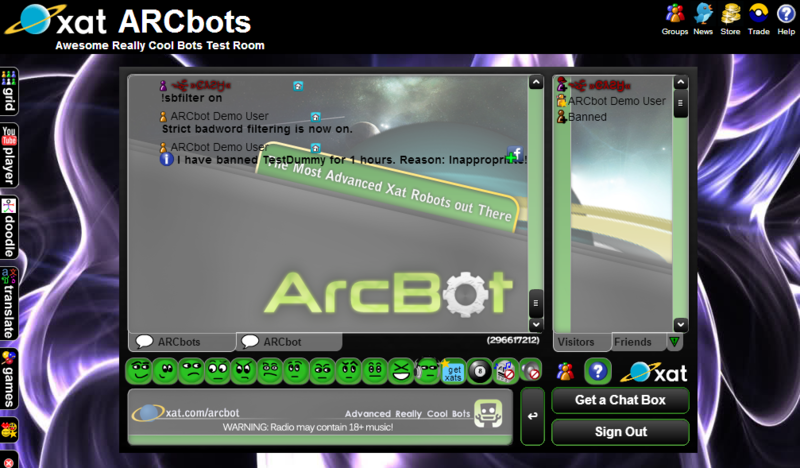 Welcome to the ARCbot Info Panel. Search for xat bot command or alias? 0 !8ball [question] The magic 8ball that answers your every question ! 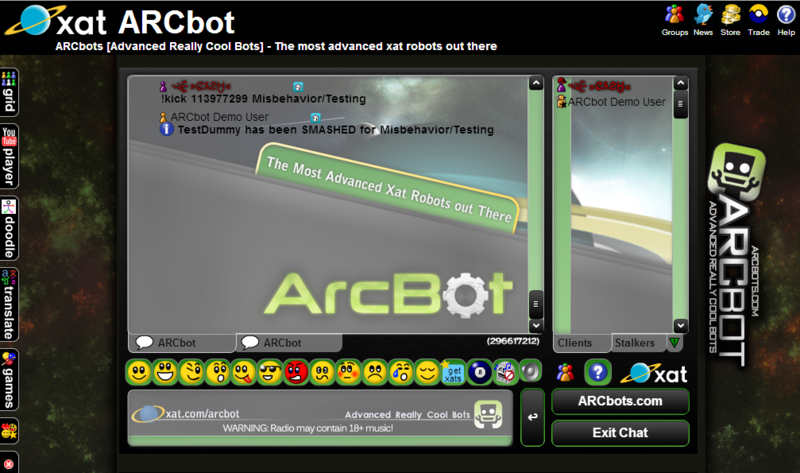 0 !botid Display your bot's botid ! 0 !buy !purchase,buybot,getbot Information on buying a bot ! 0 !casino !gamble Play the the game casino ! 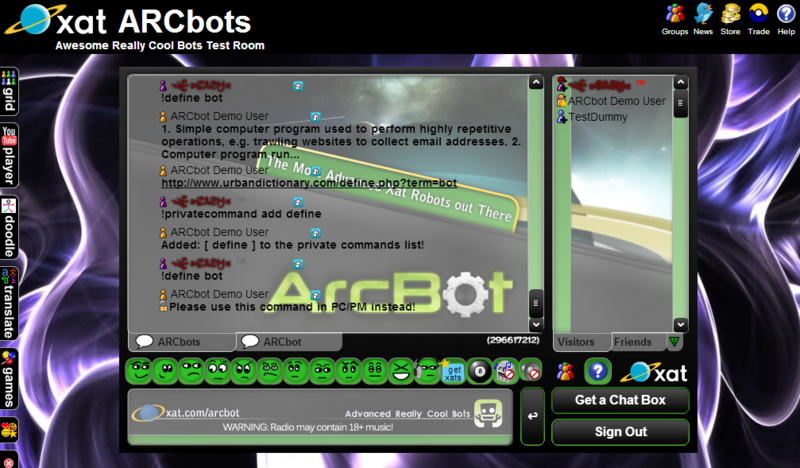 0 !commands !command,info Gives you the link to this page ! 0 !currentsong Tell you the current song that is on the radio ! 0 !dice Gives a random number between 1~6 ! 0 !dj currentrequests View current songs requested to DJ ! 0 !findmyfacebook !fmfk,fbme Finds your facebook..shhh ! 0 !guestsay !gsay Same as !say, but displays the users name ! 0 !hex [text] Gives you the hex of the text ! 0 !joke Tells a joke ! 0 !kickme Kicks you ! 0 !madgab Play the game madgab ! sees them, it'll tell them they got mail. !mail send ARCbot How you doing buddy? 0 !md5 [text] Give the md5 of the text ! 0 !sha1 [text] Gives the sha1 of the text ! 0 !myavatar !myav,mavatar Tells you your avatar link ! 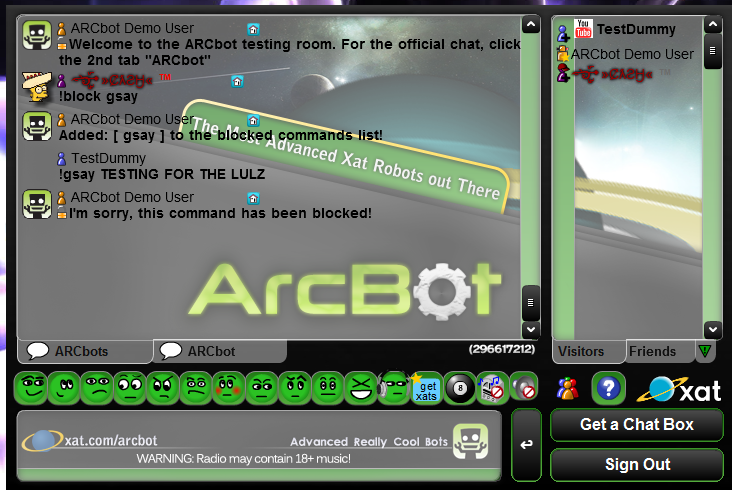 0 !radio Show the chatroom's radio station ! 0 !radioinfo !radioinformation Tells you the radios name, and listener amount ! leave blank for all] Show the names of people in that rank in the room ! 0 !umad [name] Emotes based on the command to the name ! 0 !hug [name] Emotes based on the command to the name ! 0 !kiss [name] Emotes based on the command to the name ! 0 !dump [name] Emotes based on the command to the name ! 0 !powers has !powers have,haspower,powershave,has,have [user] Check if the user has the power ! 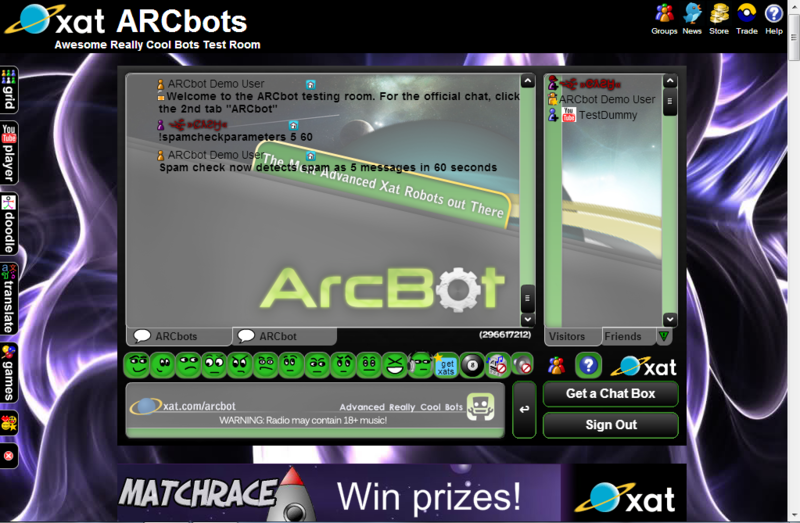 are online in the room ! 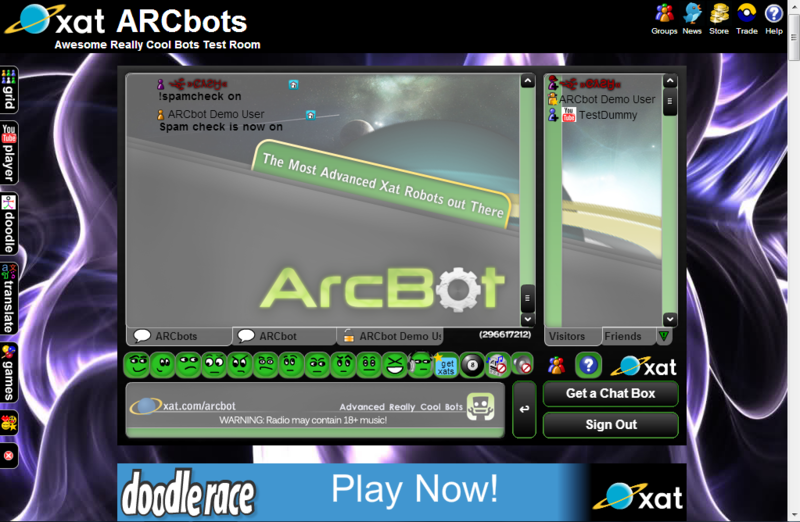 0 !xatfact Tells you a random xat fact ! 0 !yellowcardme !unyellowcardme Yellowcard yourself with the yellowcard power ! multiples [user] Check which powers are doubles on the user ! 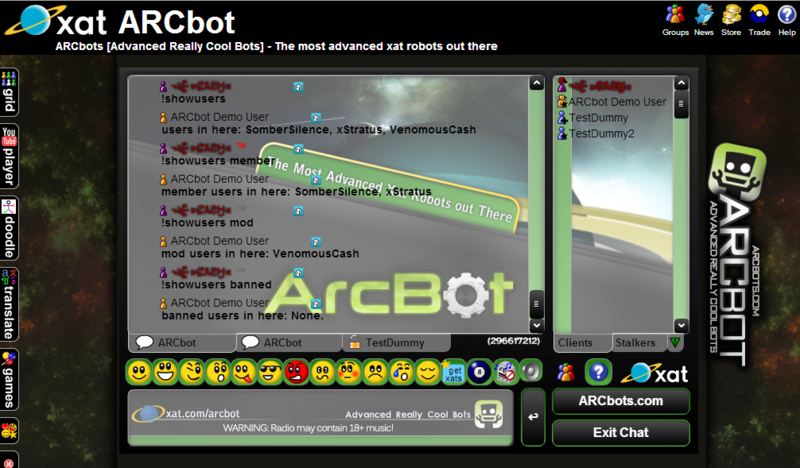 0 !banme redcard !redcardme Bans you with the ban power and how long ! 0 !group !chatroom Tells you what group you are at. ! 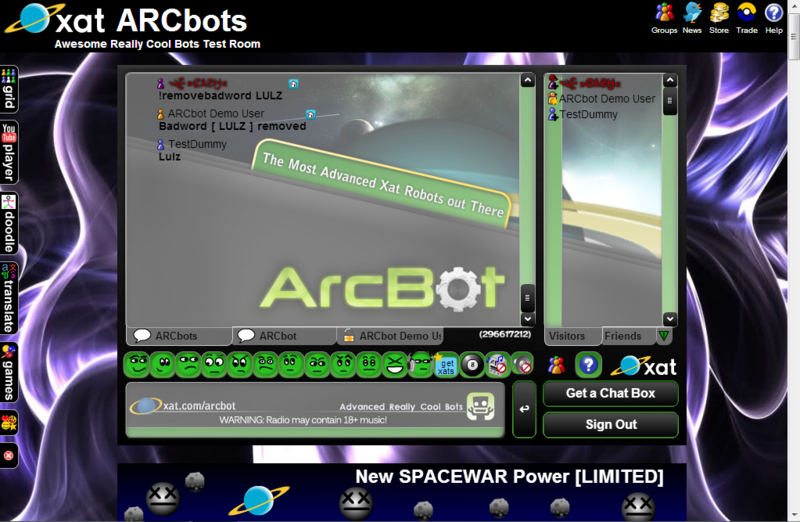 savatar,stealavatar,uavatar [user] Gives you the users avatar link ! 1 !clipname !youtubename,ytname [Youtube link] Gets the youtube link's video name ! 1 !define !ud,urbandictionary,urban,defin e2 [text] Defines the text using urbandictionary ! 1 !fact !fact3 Gives you a random fact ! 1 !fml Gets an fml quote ! 1 !google !maingoogle,g [text] Search google for links ! 1 !guestme Guests you ! 1 !memberme Members you ! 1 !modlevel [user] Tells you your mod level, or of someone elses ! 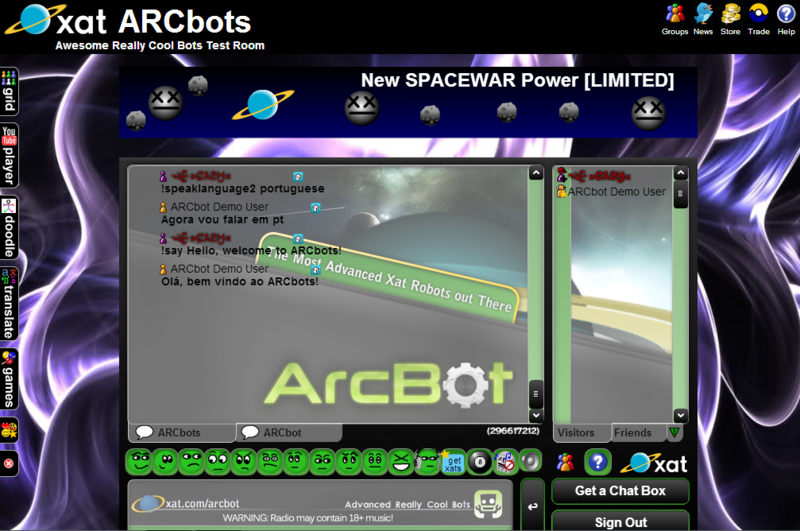 powers are left in the xat store. ! number] Gives a random number, or between number ranges ! main] Picks a random user from the room. ! 1 !ranklist [activity/lastmonth] View the manual ranks that were added ! 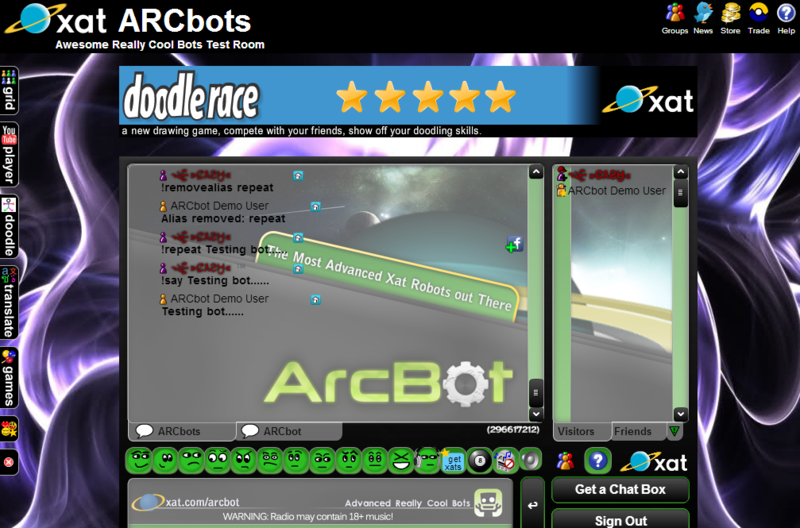 1 !regname !uregname [xat user id] Gets the users registered name ! 1 !say !speak,talk [text] Gets the bot to say the following text ! 1 !servertime Show you the server time, of ARCbots ! 1 !slots !slot Plays the game slots ! 1 !spellcheck [text] Returns the correct spelling of the word ! 1 !stealname !sn,uname,sn [user] Gets the users name ! 1 !translate [language to translate to] [text] Translates the text !translate es Hello. 1 !translate2 [Number of messages ago] Translates the text from a number of messages ago ! 1 !weather !w [zip code or location name] Gets your local weather ! 1 !youtube !yt,y [text] Searches youtube for videos ! 1 !add [number 1] [number 2] Add two numbers ! 1 !subtract [number 1] [number 2] Subtract to numbers ! 1 !divide [number 1] [number 2] Divide two numbers ! 1 !multiply [number 1] [number 2] Multiply two numbers ! 2 !moderatorme !modme Makes you a moderator ! 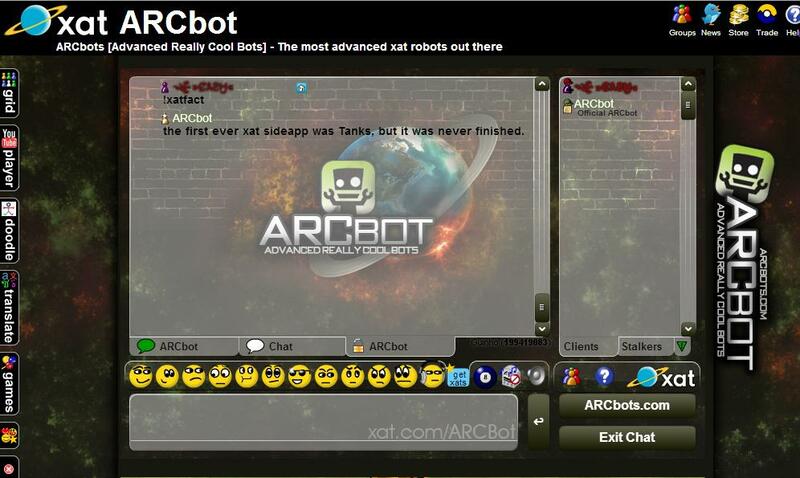 2 !bump [xat user] [message] Bump user with bump power !bump ARCbot I need your attention! 2 !latlong [address] Give the longitude and latitude of an address ! 2 !removeanswer !removea,dela,deleteanswer [answer to remove] Remove an answer from the !addquestion list ! 2 !removequestion !delq,deleteq,deletequestion,re moveq [question to remove] Remove a question from the !addquestion list ! 2 !shortnamecost !snc [hours] Get the cost of the provided shortname ! 2 !time [zip code] Get the time in the zip code's region ! 2 !unhush Un gag/unhush users in the chat using unprotect ! 2 !dj onair Current DJ on air ! 2 !dj emptyrequests Empty DJ requests ! 2 !dj removerequest [song name] Remove user requested song to DJ ! 2 !grouptransfer !chatnamecost,cnc [group name] Find the cost of a group transfer ! 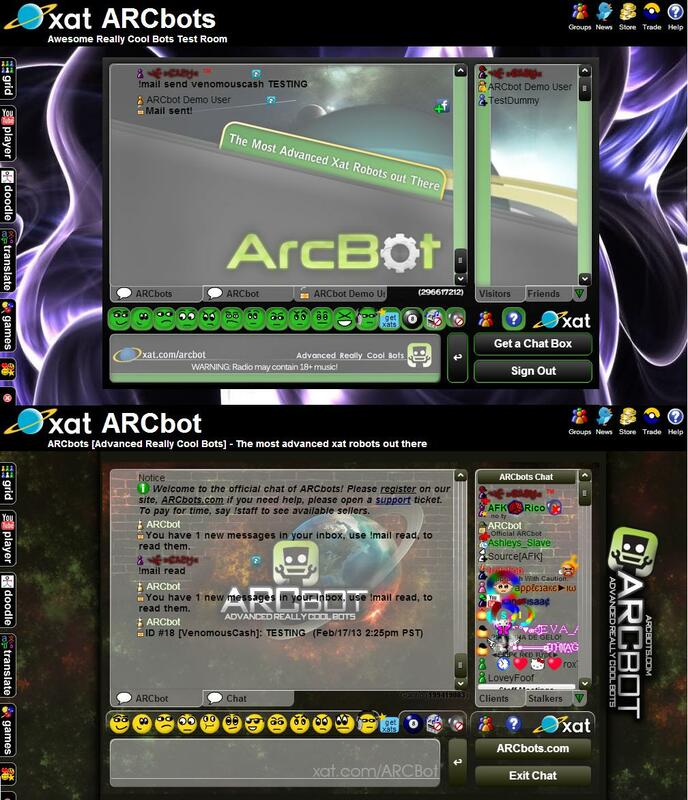 2 !app [app name/game] Open up a xat app on the bot ! 3 !clear !clearchat,cls,clearscreen Clear the chat room's chat messages ! the current month till it expires ! 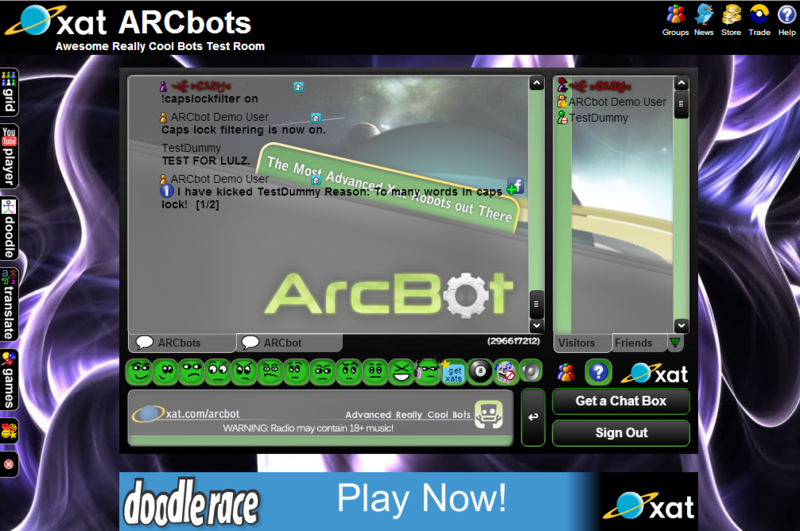 3 !runtime !onlinetime,onlinet,rtime,boton line Displays how long, when the bot first started ! 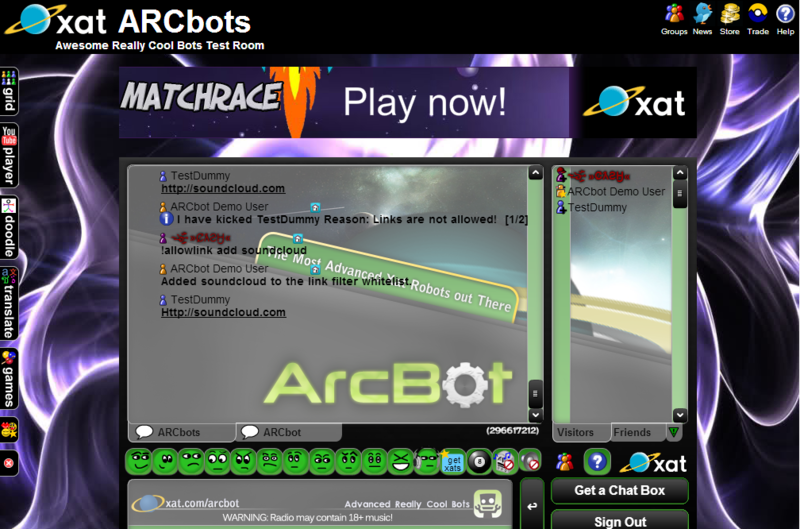 3 !scroll [text] Change the scroller in your chat ! 3 !ownerme Owner yourself ! 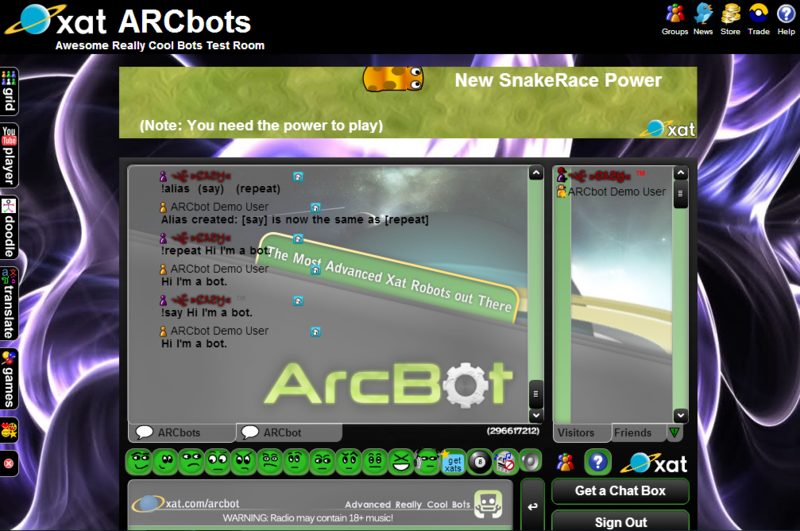 4 !away !unaway Makes the bot away or unaway with away power ! 4 !dunceall Dunces all user in the room ! 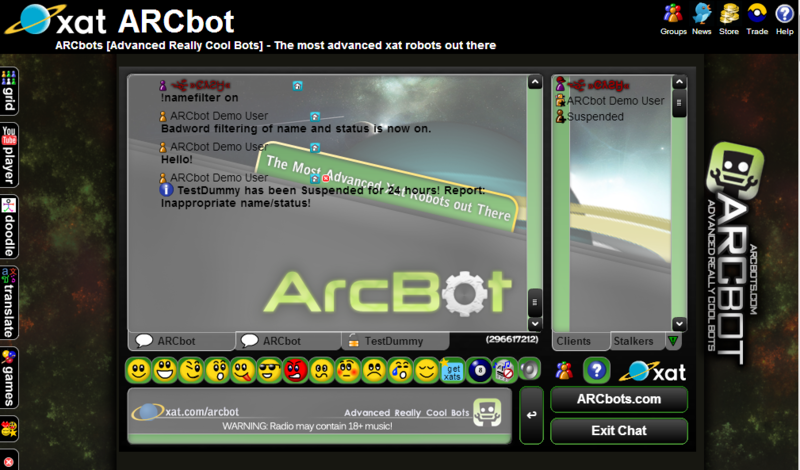 4 !killbot !killmother,die,gtfo Kills the bot, and makes it exit the chatroom ! take using the command !aq ! 4 !refresh !ref Makes the bot refresh ! 4 !relogin The bot will re-login ! commands such as !friday/bieber/song/etc ! hush power !superhush 30 Shut up. 5 !bumpall Bump all users with bump power in pc ! 5 !editbuttoncolor [button color] Edit buttoncolor on edit chat ! ote/hearts] Edit group powers sub categories ! 5 !enablepowers !disablepowers [group-power 1, group-power2, etc] Enable/disable powers from the Edit Chat button ! 5 !guestall Guests all users in the room ! 5 !guestself Guest the bot with guestself power ! any new/existing powers that you tell it to buy. 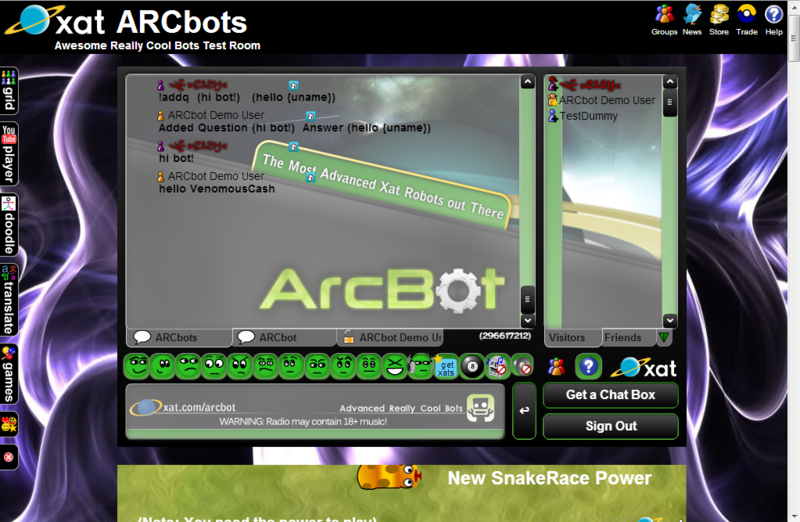 5 !memberall member all users in the room ! 5 !modall mod all users in the room ! 5 !ownerall owner all users in the room ! 5 !tickleall Tickles all users in the room ! 5 !unbanall !uba Unban all users in the current chat room pool ! 5 !zapall Zaps all users in the room ! 5 !disablepowers [group-power 1, group-power2, etc] Disable powers from the Edit Chat button !